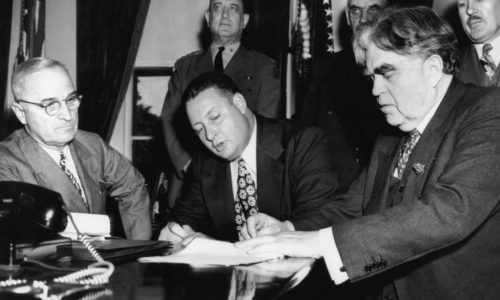 John L. Lewis and Secretary of the Interior Julius Krug sign the historic Krug-Lewis Agreement in the White House that ended the 1946 UMWA strike and created the UMWA Health and Welfare Funds. President Harry S. Truman (seated to the left of Krug) ensured the U.S. Government was the guarantor of the Agreement. To the United Mine Workers of America (UMWA) a promise is never taken lightly and without careful consideration. The terms and conditions of any agreement establishes a binding arrangement that will last for years, decades or indefinitely. A promise creates a bond between parties that obligates everyone involved to honor. Living up to the terms of an agreement defines trustworthiness and integrity of the individual, institution, business or government making the promise. The Promise of 1946, also known as the Krug-Lewis Agreement (Agreement), was a deal struck between the United States Government, the United Mine Workers of America and accepted by the coal operators to end a nationwide strike by the Union following the end of World War II. With President Truman looking on, the historic Agreement was signed by Interior Secretary Julius Krug and John L. Lewis in the White House a week after the United States Government seized the mines. Among other things, the Agreement created a welfare and retirement fund and a separate medical and hospital fund. 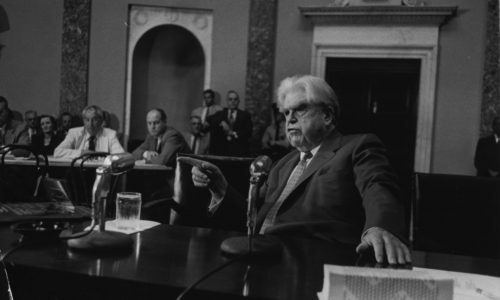 The two were later combined to create the UMWA Health and Retirement Funds (The Funds). “The Promise made in the White House in 1946 did several things, but none was more important than guaranteeing retirement security for coal miners and their families for their service to the Nation, including cradle to grace health care,” stated President Roberts. ” Since that time, Union miners have continuously worked to energize and protect their Country. To this day UMWA Members faithfully uphold their end of the agreement, and we intend to hold the government accountable. 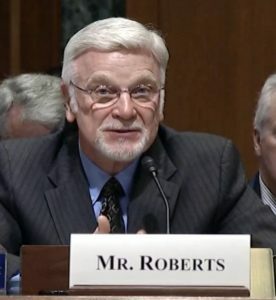 President Roberts testifies before the Senate Finance Committee pressing the Committee members on the importance of bringing S. 1714 to a vote. He stressed that honoring the Promise of 1946 before the end of this year was imperative if Congress was to prevent tens of thousands of miners and their surviving spouses from losing their hard-earned health care.